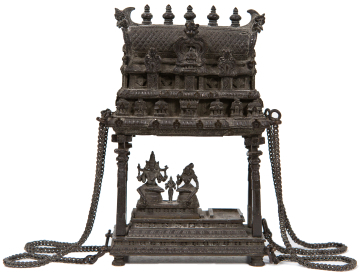 Model of a South Indian temple with a group of figures beneath the temple roof: Shiva, his consort Parvati and their son Skanda (or Kartikeya), bronze. 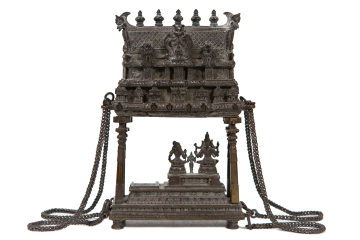 You are here: CollectionsOnline / Model of a South Indian temple with a group of figures beneath the temple roof: Shiva, his consort Parvati and their son Skanda (or Kartikeya), bronze. This small model was described in the 1837 'AB' inventory as 'A small ancient Canopy of Hindoo Architecture with two sitting figures - Bronze'. Mr. David Bennie commented in 1995 that although this is a typical South Indian bronze group the empty slot beside the figures is a little unusual 'since the group is usually represented alone - it might have been for an image of Shiva's other divine son - the elephant-headed Ganesha'.